Updated: The Mossberg 464 SPX: 6 Reason to buy one. I can admit it when I’m wrong. I can change my opinion when new information comes to light. And I can change my opinion when something I once thought a disgusting abomination proves to be actually useful. Well, in this case, that Something is the Mossberg 464 SPX. When I first saw it in photos I thought it was a joke. When I first saw it in person at SHOT Show, I was horrified. But over time, the Mossy 464 series has grown on me. And the SPX version has even become less offensive to my Lever Sensibilities. Now I’m at the point that not only to I actually like them… But I actually really WANT ONE. Here’s what I like about the 464 SPX from O.F. Mossberg & Sons, Inc.
1. It has good sights and not Buckhorns… No one likes Buckhorns, not even guys who know how to use them. And these work in lower light conditions. 2. The stock adjusts to fit different sized shooters, or the same shooter through all four seasons. 3. The muzzle end is threaded. This means you can take off the flash hider and put on a muzzle brake, or a suppressor… Or a thread protector and have nothing on it. You have options. 4. It’s a Mossberg… so while it’s not a Japanese made Winchester, or a questionably made Marlin, or Brazilian or Italian made whatever… It’s a solid, hardworking US Made rifle that’s going to get the job done. 5. The safety is actually in a logical place for a Lever Action. 6. These things actually shoot very well. It does look better with a coating on it. Ugly? Indeed… But it works. And that makes it rather attractive to me. I think if I had one I’d get the gun Cerakoted for improved corrosion resistance, put a sling on it and cover the rails… Maybe change the stock to a lighter unit. But that’s less important. I’d put a Battlecomp on it first chance I got. And then I’d call it good. Updated: Okay, you guys know I am not one to leave well enough alone. I’ve been looking at the 464 series of rifles and there seems to be some holes in the line that could be filled. The 16″ barreled SPX loses a round of capacity and a chunk of velocity from the standard 464 rifle with the 20″ barrel. I think it would be nice to offer a 20″ SPX and let it take advantage of that extra oomph and extra round. That’s one thing. 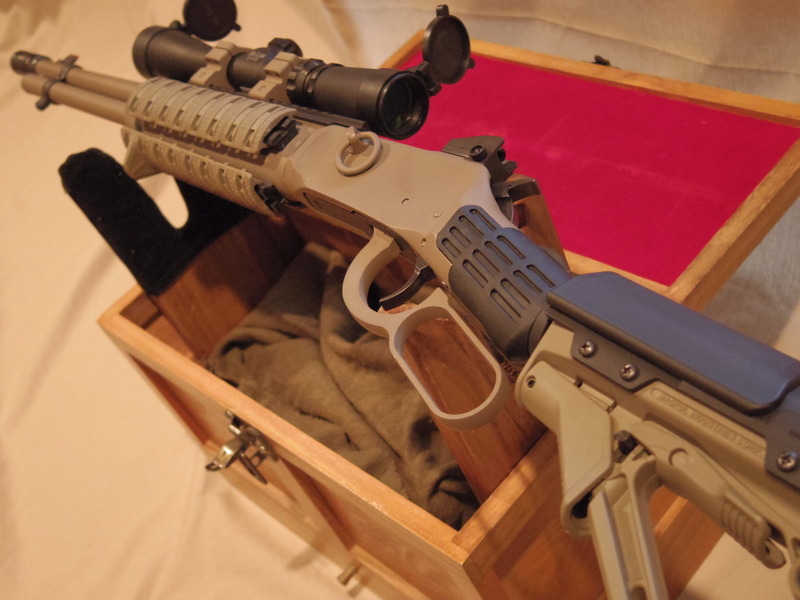 The other thing, is the they have a nice weather proof marine finish… but with a not so weather proof wood stock. How about a Marine Finished SPX? And how about a Marine Finished 464 with a regular furniture, but in a sturdy synthetic? I know I’d like that. I’d also like a Trapper version of the 464. Traditional, but in 16″. Okay, we’ve got this ball rolling… Where is a .45-70 gun? That’s right… I’m looking for a Guide Gun Alternative here. The 464PH, Professional Hunter, make it like the Marlin’s SBL… top rail, big loop… Do the same config in .30-30 as well. And while we’re talking calibers… Let’s look at a .44 Mag version of the SPX and Trapper. Can the stock be changed out for a more traditional stock? I just can’t handle that thing on a lever gun. The rest is okay. Yeah, you probably could. But if that’s what you want – you could save yourself a few bucks and get a regular 464 Lever Action. I like the rails and the muzzle. There are some upsides to it. THAT thing is just… hideous. The one 464 I handled had a pretty stiff and gritty trigger, although that was shortly after it was introduced. If they’ve worked the bugs out of it, I might be interested in a standard version. The 464 SPX, on the other hand…no. Just no. It looks about as awkward and impractical as that fugly pistol-grip Mossy 500 with the Barrett-style muzzle brake. 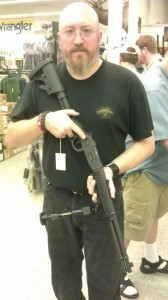 What is it about Mossberg, that makes them want to mall-ninja their entire product line? For guys like me that prefer weird hybrid guns and don’t like having the same, boring AR everyone else has. Kind of a ready made CAR (Cowboy Assault Rifle)?! My first reaction is that it is ugly, but functional. Sigh.. it does kind of grow on me over time. I am beginning to get an itch! If they made the 464 in .357 at that price point I’d own two. As it is, I just can’t justify a .30-30 with iron sights only. This is where the mistake is yours. “Justify”. Sir, we need not Justify a Want. It’s a Want. And for us, damnitall, that’s good enough. Please, yes. Give me a standard or Trapper-length 464 in .357 or .44 SPL/Mag, wood-stocked with a good trigger and either the 464 SPX’s sights or a rear peep/front bead. And hold the mall-ninjaery. It might even make me rethink my lust for a Henry Big Boy. Mossberg doesn’t make that. That’s a customized job. What sights are those, and didn’t you have mod? Stock sights in all the photos from the looks of them. I also thought it was a joke, but it does grow on you. 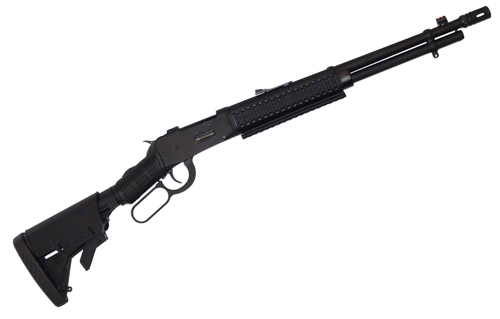 How about an 18″ barrel in a marine finish and 38-55 cal. & laminated stock. The Mossburg 464 has a good future if they iron out the kinks. I’d like to see one in .357 Magnum with a Winchester 92 sized action. I personally own a 2nd Gen SPX 30-30, I’ll admit I don’t like the quarter rail the 2nd Gen has vs the full rails on the original and the fact that it is a “home defence” lever action. All that aside, that little Mossberg is beyond impressive. Yes it’s ugly, no agurement there. I always get funny looks when I brandish it. But for bush hunting and guiding it’s perfect. I treat my SPX like my 45-70 Marlin Guide rifle in a 20″. I like to stalk and track, the SPX has claimed 3 bucks since 2015. It puts meat in the pot reliably. Sad part is this day and age hunting is all about comfort and distance. Blinds, tree stands, and feeders. Few understand how hunting was done in the past, everyone just wants to “bag a 10 point” while sitting on thier rears in a high dollar blind or hide, sipping hot cocoa. At 35yards the SPX with factory sight dropped my recent 12 this season. Pick one up and have some fun.